Photo Credit: Submitted photo - Burlington Bishop Christopher Coyne addresses a Catholic Town Meeting in Rutland. As a series of six Catholic Town Meetings in Vermont concluded, Burlington Bishop Christopher Coyne expressed the hope that similar meetings will take place again. “I plan on having these regularly now over the course of my time as bishop because they have been so fruitful,” he said. He hopes to schedule a set of Catholic Town Meetings to take place once or twice a year as time allows at different locations throughout the state during each session. 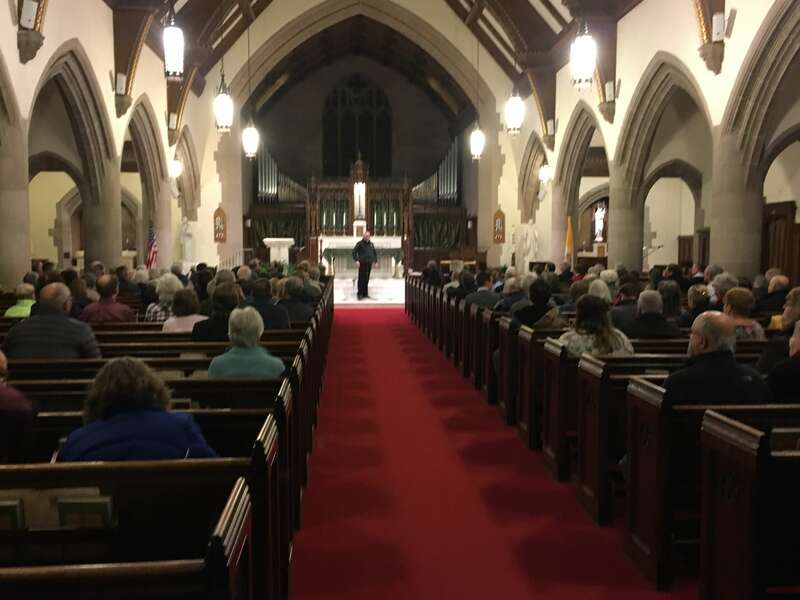 The final two of six Catholic Town Meetings in Vermont took place at St. Theresa Church in Orleans and Christ the King Church in Rutland on Feb. 4 and 5, respectively. More than 100 people attended the Rutland meeting, more than expected. This reflects what has proven true at each of the meetings intended to increase and improve opportunities for two-way communication between Burlington Bishop Christopher Coyne and the faithful — the laity want to be a part of the conversation regarding the future of the Church in Vermont. As at earlier Catholic Town Meetings in January, the 90-minute gatherings began with prayer and brief remarks from the bishop, who shared information about the recently concluded Diocesan Synod, the status of abuse allegation reviews and plans to work with the Catholic Leadership Institute to help parishes become more vibrant. Following Bishop Coyne’s opening statements, attendees asked questions on issues including child protection, confirmation age, the role of faith in politics, the possibility of female or married priests, that status of the former Cathedral of the Immaculate Conception in Burlington and how to encourage young people to be involved in parish life. The bishop thanked people for their honesty in sharing their thoughts and concerns with him and in return offered honest and direct responses to their questions. Both the Rutland and Orleans meetings had been rescheduled from evenings in January due to severe weather.